Werner Jewelers provides onsite repair services for individuals and surrounding jewelry stores alike. Please stop in with any repair questions you may have and meet our jewelers. Like a fine car, fine jewelry needs maintenance/repair. You should have you jewelry checked at least once per year. 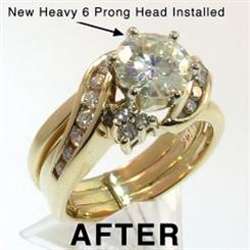 Worn or damaged prongs can lead to the loss of the gem. 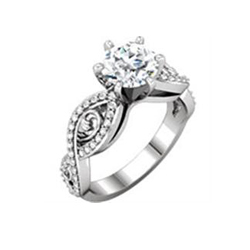 A loose diamond will (over time) cut through the prongs and fall out. A faulty or dirty clasp may cause you to lose your entire necklace and any pendant that may be on it. Below is just a partial list of services. Please stop in to Werner Jewelers, we can help with any of your jewelry repair needs. Is your jewelry box full of pieces you never wear? Wouldn't you love to turn them into beautiful, fresh styles at a fraction of the cost? This is one of our specialties at Werner Jewelers. 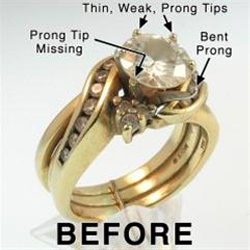 Remounting your old stones in new settings is by far the smartest and least expensive way to update your jewelry collection. Bring in that old ring that has lost its meaning and turn it into a fabulous fashion statement! Transform an outdated piece that you would never wear into a stylish pendant or dinner ring - so easily and affordably. We will even buy your scrap gold to use towards your new jewelry. Stop in today and we can show you hundreds of ways to turn something old into something new. Have your diamond reset into a new setting! Fantastic inventory and knowledgeable sales people. Their repair work on my vintage ring was extraordinary! Highly recommended as a reputable jeweler with unique items and personalized service! My experience at Werners was great. They were able to repair my wedding band and charged exactly what they quoted. The ring looks great.